Raith Rovers directors have drawn up a shortlist of candidates for the manager's position. Raith Rovers are to start interviewing for the manager’s job after drawing up a shortlist from over 100 applicants. Rovers have had huge interest in the post following the dismissal of Grant Murray last week, with the CVs of four overseas international managers among those to drop into the Stark’s Park inbox. 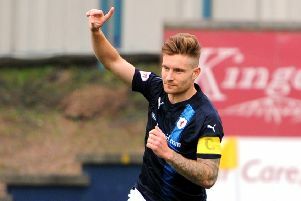 The Raith board met on Tuesday night and narrowed the list down to “no more than half a dozen” interview candidates, with an appointment hoped for within two to three weeks. Eric Drysdale, club chief executive, told the Press: “The response has been unbelievable. “When going through the selection process last time, there was nothing like this level of interest. “Take away the fans with a sense of humour and there are a good 100 or so football people with varying degrees of experience, from Scottish football, down south, Europe and around the world. Drysdale was keen to point out that the board is looking for someone capable of taking the club to the next level. “We’re looking for the complete package – someone who ticks a lot of boxes,” he said. Drysdale refused to confirm whether Murray’s assistant, Laurie Ellis, or director of football, Maurice Malpas, were among those being considered for the post. Meanwhile, Rovers have been pleased with the response to the early bird season ticket offer, with over 150 supporters queueing at Stark’s Park in torrential rain on Tuesday to take the total number sold so far to 800. “We’ve had a very good response,” Drysdale said. “We’ve not quite reached the heights of last season but it’s still a very healthy number that a number of Championship clubs would be jealous of. The early bird offer is now closed, with the exception that existing season ticket holders can still renew online at discounted rates until midnight on Sunday.